Gen. Richard Myers, interim president of Kansas State University, has been named a 2016 recipient of the Lifetime Achievement Award from the Air Force Association. Myers is one of five recipients of the honor, which recognizes a lifetime of work in the advancement of aerospace. Award winners are selected by a committee that includes the association's chairman, two vice chairmen, president and two former chairmen. According to the association, Myers is being recognized for his long Air Force career, including his service as chairman of the Joint Chiefs of Staff in the tumultuous time right after 9/11 and helping guide strategy for the war on terror. 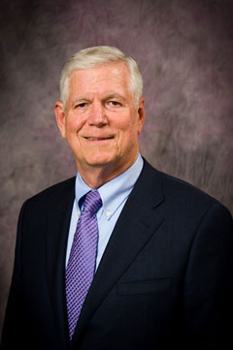 Myers, a 1965 graduate of K-State with a bachelor's degree in mechanical engineering, joined the Air Force through the university's ROTC program. From 2001-2005, he served as the 15th chairman of the Joint Chiefs of Staff. As chairman, Myers was the highest-ranking uniformed officer of U.S. military forces and served as the principal military adviser to the president, secretary of defense and the National Security Council. He retired from the Air Force in 2005 as a four-star general. A command pilot, Myers logged more than 4,100 flying hours, including 600 combat hours. His largest commands included U.S. Forces Japan and 5th Air Force at Yokota Air Base, Japan; Pacific Air Forces at Hickam Air Force Base, Hawaii; and the North American Aerospace Defense Command, U.S. Space Command and Air Force Space Command at Peterson Air Force Base in Colorado. He has received numerous awards and decorations for his service, which include Legion of Merit, French Legion of Honor and Presidential Medal of Freedom. The Air Force Association is the voice for aerospace power and the Air Force family. It connects service members, and the total Air Force family, through professional development, programs and support initiatives before, during and beyond their time in uniform. Interior design program ranked No. 6 in the U.S.